UNDATED - For the week ending Sunday, mostly dry conditions prevailed in South Dakota, according to USDA's National Agricultural Statistics Service. Temperatures were near or above normal across the State with spotty rainfall in western counties. Soil moisture ratings continued to dry and crop conditions declined. There were 6.5 days suitable for fieldwork. Topsoil moisture supplies rated 21 percent very short, 33 short, 43 adequate, and 3 surplus. Subsoil moisture supplies rated 18 percent very short, 34 short, 46 adequate, and 2 surplus. Winter wheat condition rated 12 percent very poor, 26 poor, 33 fair, 28 good, and 1 excellent. Winter wheat jointed was 97 percent, equal to last year. Headed was 78 percent, ahead of 72 last year, and well ahead of 47 for the five-year average. Spring wheat condition rated 4 percent very poor, 28 poor, 43 fair, 22 good, and 3 excellent. Spring wheat jointed was 54 percent, near 56 last year. Headed was 10 percent, ahead of 3 last year, and near 7 average. Oats condition rated 2 percent very poor, 13 poor, 36 fair, 45 good, and 4 excellent. Oats jointed was 57 percent, behind 64 last year. Headed was 17 percent, near 19 last year and 16 average. Barley condition rated 2 percent very poor, 27 poor, 57 fair, 14 good, and 0 excellent. Barley jointed was 10 percent, behind 29 last year. Corn condition rated 0 percent very poor, 6 poor, 32 fair, 58 good, and 4 excellent. 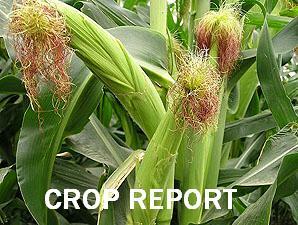 Corn emerged was 90 percent, ahead of 82 last year and 85 average. Soybean condition rated 0 percent very poor, 3 poor, 38 fair, 55 good, and 4 excellent. Soybeans planted was 92 percent, ahead of 82 last year and 83 average. Emerged was 62 percent, near 58 last year, and ahead of 55 average. Sorghum planted was 49 percent, well behind 78 last year, and behind 55 average. Emerged was 21 percent, behind 30 last year, but near 18 average. Sunflowers planted was 48 percent, near 47 last year, and ahead of 33 average. Emerged was 2 percent. Alfalfa hay condition rated 28 percent very poor, 37 poor, 22 fair, 11 good, and 2 excellent. Alfalfa first cutting was 26 percent, near 28 last year. Pasture and range condition rated 21 percent very poor, 19 poor, 26 fair, 30 good, and 4 excellent. Stock water supplies rated 4 percent very short, 22 short, 72 adequate, and 2 surplus. Data for this news release were provided at the county level by USDA Farm Service Agency, SDSU Extension Service and other reporters across the State.